*2.5" CIRCLES : 4 DESIGNS : baseball, ball w/ bats, play ball, H.B. *DOOR SIGNS - 2 DESIGNS : H.B. Baseball, Welcome Play Ball! *CENTERPIECE PENDANTS : 6 DESIGNS : play ball, baseball, all star, ball , ball, H.B. Instant Download Files will be available after payment is processed. *The download link will be EMAILED to you within 1 - 10 minutes after your payment is confirmed. Be sure to check your Etsy Registered Email Address (it WILL NOT appear on your Etsy Transactions page). 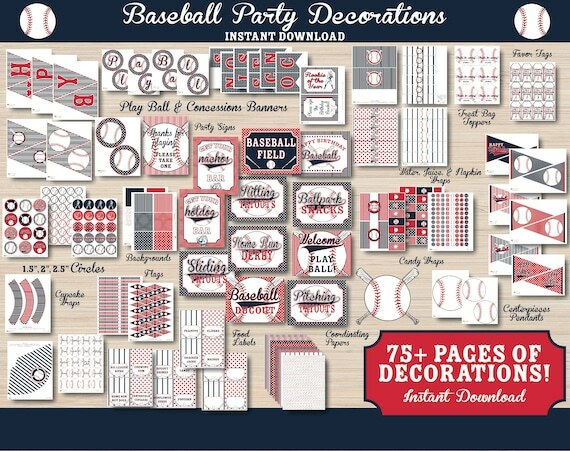 At this time we do not offer printing services on decorations, and all decoration set items are digital files only. They will be sent via email to your email on files with etsy from a files sharing service in PDF format. Only ONE PHOTO may be sent for a photo invitation order. The quality of the printed photo invitation is only as good as the photo you send to us. Please make sure the photo is a high resolution photo taken with a camera. If the photo is blurry or grainy when sent to us, it will appear so in the invitation also.